You are currently browsing the Carpe DMM blog archives for December, 2014. On the spur of the moment, my wife and I decide to take an overnight driving trip to the Hunter Valley, 100km north of Sydney. We left on Monday, 29 December, and drove up the quick way, using the freeway until the Cessnock turnoff, where we cut inland to the valley. 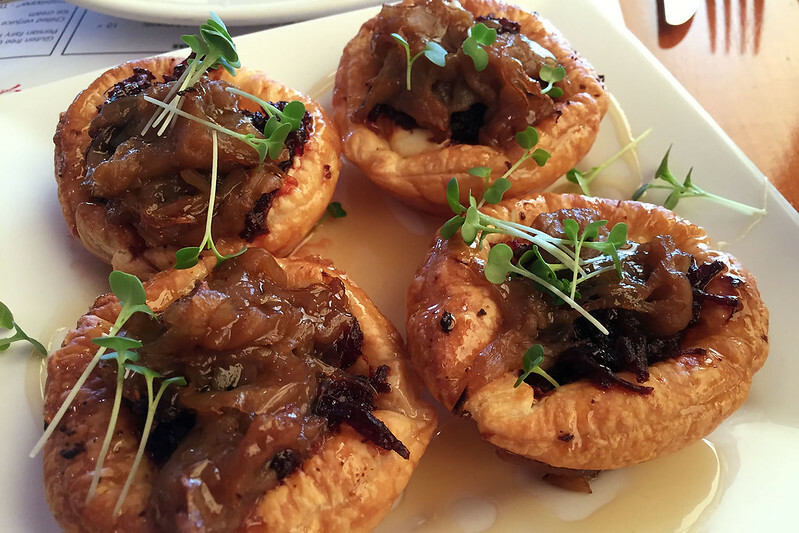 We stopped for lunch at Tatler winery, which has a cafe that serves tapas-like lunches. We had some duck liver pate with lots of trimmings, and goat’s cheese tarts, which was plenty for two people to share. We drove around various places, stopping at Handmade in the Hunter markets at Kevin Sobel’s winery, browsing around the stalls there. I bought some chilli sauce from the Hot Chilli Woman. We are sitting in Marrakesh International Airport, waiting for our flight to Madrid. It’s a very small airport by international standards, with one large waiting area and what looks like just three gates. It looks like they don’t even have jet tubes, and we might have to walk across the tarmac to board the plane. We got up a bit before 07:30, and thankfully the hot water was working again, so we both showered and dressed for today’s travel. We repacked our bags from scratch and regained enough space to fit everything in. I am carrying the fossil plates we bought to make sure they don’t get smashed in the luggage, and M. is carrying the ceramics we got in Fes. Our final breakfast in Morocco was leisurely. This time the cake was an orange cake, and the varying bread product was thin squares of fried pastry, all crispy with no doughy part, sprinkled with sesame seed and a few spots of honey. The yoghurt selection today included pistachio yoghurt, which we both tried. I scraped the fuzz off a kiwifruit and bit into it, but it was very sour. We saw Bev and Colleen again, and the rest of their tour group, who ate at the large communal table, while we sat at a table for two. Colleen said there was a mix-up with their dinner last night, and she got left behind when she went back to her room to collect something, and they had to send a taxi to pick her up and take her to rejoin her tour group! After eating, we packed and double checked we had everything, then left the room, handed the key back to one of the cleaning ladies, and sat to wait for our airport transfer at 10:45. We took the time to check how to get from Madrid Airport to our hotel for tonight. It looks like we can use the Metro, but we will have to change lines twice to get to Opera, the nearest station to the hotel. Fortunately from there it’s only about a 50 metre walk to the hotel. During our trip here in Morocco, several of the people we were travelling with accidentally took euro out of their wallets instead of dirhams and didn’t realise it. Someone told a story about people accidentally paying with euro and the merchant taking it without comment, thus making a huge profit at the expense of the unfortunate traveller. So we kept an eye on other people’s money and corrected their mistakes a few times. M. has checked out the few shops here in the airport waiting lounge, and spent the last of our dirham notes, using 70 to buy a small parcel of chocolate coated almonds. All the prices here are marked in euro, not dirhams, but they accepted the dirhams. The chocolates are ridiculously expensive, but we won’t get another chance to spend our dirhams. Our flight to Madrid should have started boarding 15 minutes ago, but the plane hasn’t even landed here yet. We wanted to get rid of our last handful of dirham coins. I looked for a charity donation box, but couldn’t find one. So I suggested we could give them to the toilet cleaning ladies when we use the toilets before getting in the flight, even though when I went earlier I saw no evidence anywhere of them collecting money. But then I found a charity box in another wander, and dropped all the coins in. And them M. went to use the toilets, and the cleaning ladies had their hands out asking for coins as she emerged! 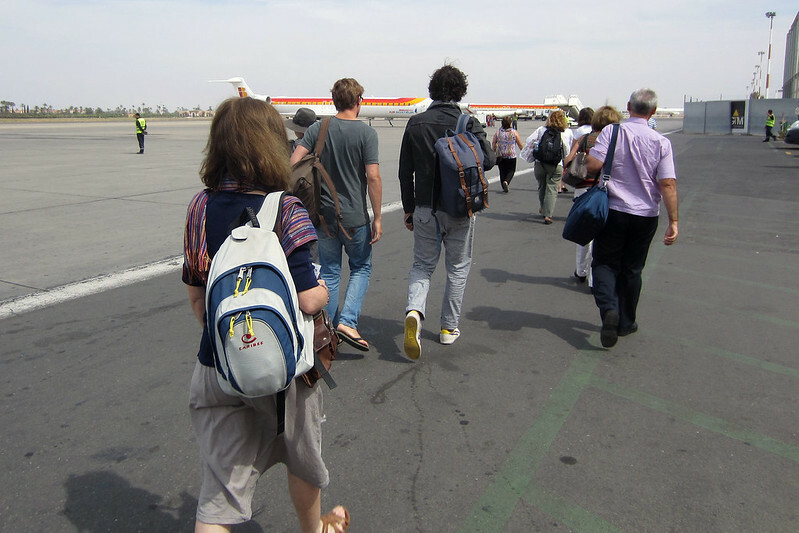 Boarding our flight from Marrakesh to Madrid. We are relaxing on our extra day after the tour! We woke up leisurely a bit before 08:30 and dressed to go to the roof for breakfast. Jill and Jay were there, with bad news overnight. Air France is on an extended strike and their flights out of Morocco to Hong Kong via Paris have been cancelled. So they were busy figuring out what they could do about that. Also present were Ben, Maria, Karen, Heather, Greg, and Graham, with everyone else having left early. For breakfast this morning they had cooked flat crumpet-like pancakes with big bubbles in them, and there was a big bowl of fresh fruit: apples, bananas, and kiwifruit. I tried a pancake, then had a bowl of corn flakes with yoghurt, and then cut myself a fruit salad and had that with yoghurt too. Karen and Heather were ordering lunch from the riad’s food menu, since they were leaving shortly after lunch time, and M. decided we’d stay in for dinner tonight rather than wander the streets at night any more. We figured one set menu of salad, couscous, and fruit for dessert would be enough for us to share, so ordered just one of those. The price was very expensive at 220 dirhams. We think they charge so much and need the orders early to go and buy ingredients, since we assume they actually don’t cook food here very much – it’s not really a restaurant. After breakfast we said goodbye to everyone, and to Lahcen as well who we saw hovering about before he checked out and left for home. I thought Ben said he might be hanging around the pool about 4pm this afternoon, but he doesn’t seem to be here any more, so maybe he’s gone to the airport already too. 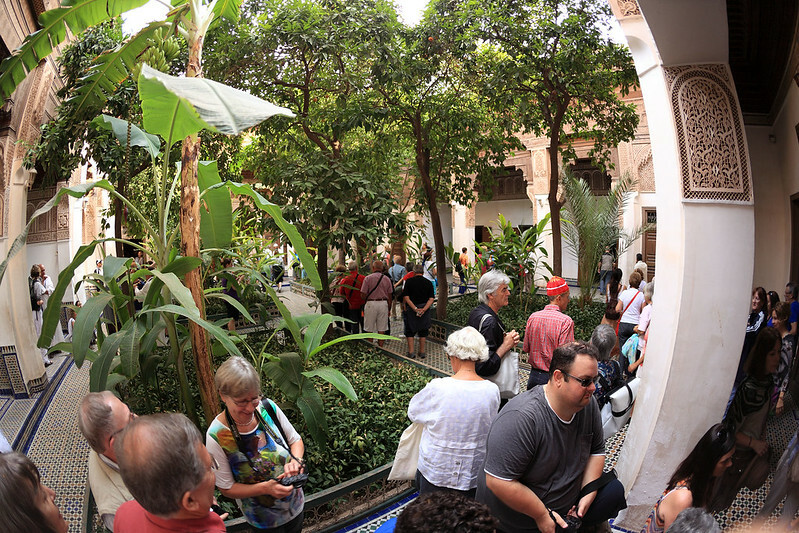 We prepared for our final day in Marrakesh and set off to walk north towards the Koutoubia Mosque with the tallest minaret in Marrakesh, near the Jemaa el-Fnaa square, and then on to some of the parks and gardens in that direction. Ben had said one of them was a “cyber park”, with free WiFi and computers. We ran the gantlet of the busy streets and had a close look at the mosque, which had an area of old ruins immediately adjacent to it on the north side. The exterior of the mosque looks quite old and in poor repair, but it is apparently still an active mosque. Perhaps the interior is nice, but we couldn’t have a look to find out. We are relaxing just before dinner with the group, our last dinner of the tour. We woke up at 07:40 and got ready for breakfast at 08:00. It was a bit late being prepared, so we hung out on the roof terrace in the cool morning air for a bit until it was ready. The repast consisted of baguettes and roti with jams and butter, plus a selection of corn flakes or chocolate cereal, and yoghurt. I hadn’t had cereal for several days, so I had two bowls of the corn flakes, one with apricot yoghurt and one with strawberry yoghurt. A crunchy breakfast after so many days of bread and jam and boiled eggs was luxury. We have just returned to our riad after the last dinner of the tour – a long and special event at a fancy hotel restaurant in the new town area of Marrakesh. Winding back to breakfast, we assembled for the final walking tour of the voyage. We met the local guide, a man named Mustafa, wearing a light brown jellaba with the hood up, and short horizontal glasses. He led us out through the hectic streets to the prime ministerial palace Palais Bahia, which is the only palace in Morocco which visitors are allowed inside. He stopped on the street along the way to explain some of the history of the Berber kings and the palaces, including this one. Entering the palace gates was an immediate breath of fresh air, as the traffic vanished, to be replaced by fruit trees and a peaceful courtyard. The only thing to dodge now were the hordes of tourists. There were dozens of huge tour groups of 40-50 people being led around by guides carrying flags and signs. 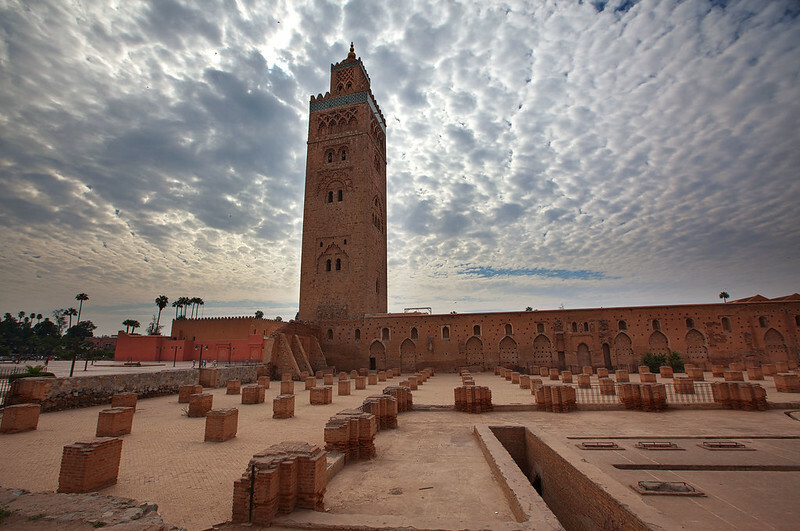 I haven’t seen so many tourists in one place since… probably since the Hassan II Mosque in Casablanca, actually. 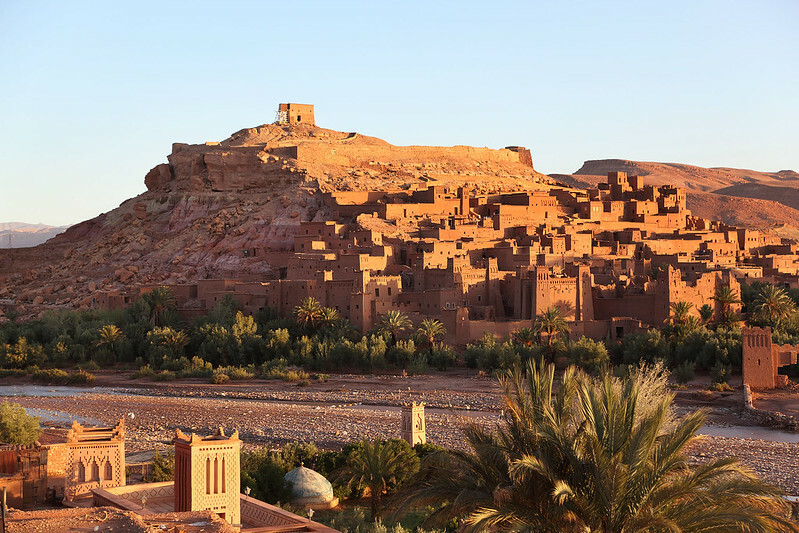 Aït Benhaddou is a popular tourist spot because it is a day trip from Marrakesh. 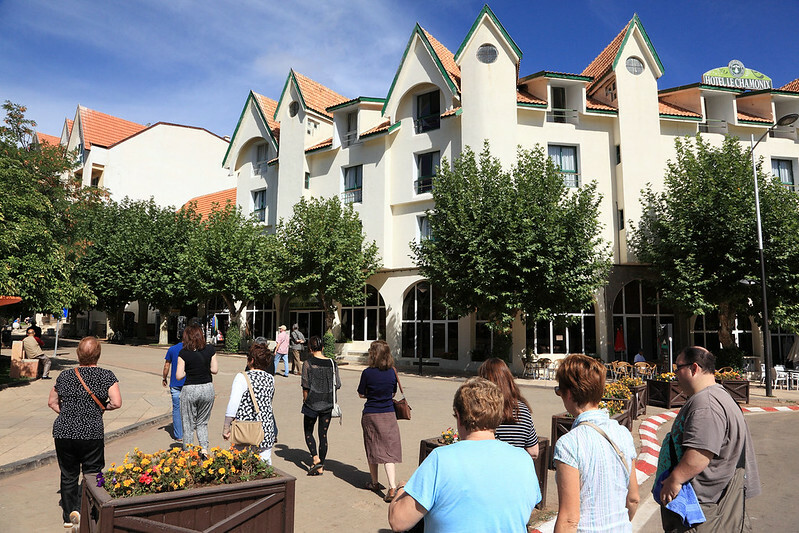 Apparently the village here is swarming with tourists at lunch time, and becomes deserted overnight. Although the hotel we’re staying at seems to have hundreds of rooms, and a luxurious swimming pool, we seem to be the only people staying here. We woke with the alarm at 07:15 after probably the best sleep of the trip so far. Breakfast from 07:30 was a familiar looking selection of bread, jam, honey, boiled eggs, and freshly curled butter in a dish. The fried bread here was small squares which looked different to the donut rings in other places, but tasted the same. The bowl of apricot jam was enormous, a huge salad bowl full of the stuff. We were the first there on the terrace, joined by Leanne and Michelle and Terry soon after. The view from the terrace was amazing, on to a sunlit slope of mud brick buildings. After packing the bus we are heading on an hour long walk through the village up that hill to see the view before driving to Marrakesh. View of Ksah Aït Benhaddou from breakfast. We have just hit the road out of the M’Goun Valley. I learnt a word of Berber this morning. I said “shukraan” to the owner of the gite where we stayed, and he said that was Arabic, in Berber it is “sahaa“. I got up at 07:30 and went for a walk outside, a short way up the valley to get away from the buildings to take some photos. When I got back, we went into a room in the back of the gite where women were making bread in a wood fired oven. The room was smoky, and one woman was mixing some sort of watery sounding mixture in a plastic drum suspended by ropes on a wooden frame, while another was baking loaves, taking the prepared flat rounds of dough from a series of piles separated by damp cloths. 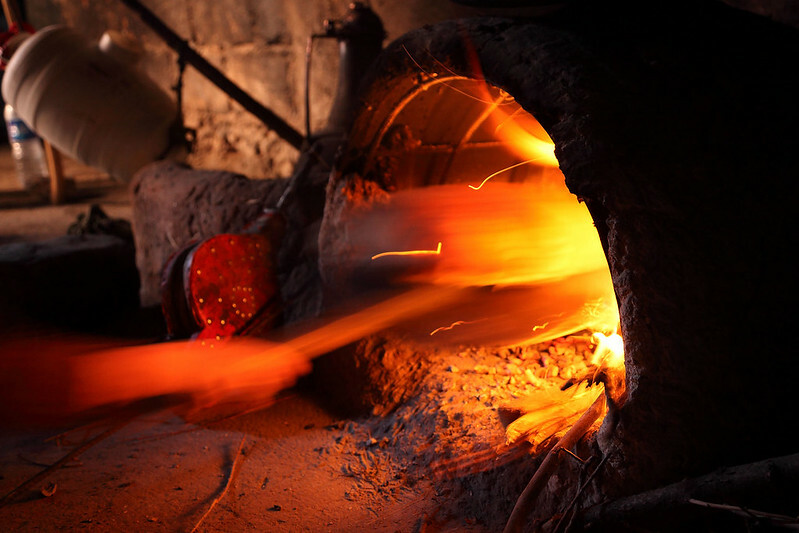 The oven was small, just large enough to bake one of the pizza-sized loaves at a time, and the woman kept feeding in broken sticks to fuel the fire. The bread puffed up hugely with air inside as it cooked, then flattened out again as it cooled. Another woman observing the process saw Jill taking photos on her tablet and became interested in seeing the large, colourful shots. She scrolled through a couple she had taken in the baking room, and then more staff arrived and asked to see more photos. She ended up showing them several dozen photos, going all the way back to our camel ride in the desert, with a crowd of five people looking over her shoulders at them! Baking bread for our breakfast, in Gite d’&eacute’tape Tamaloute. The breakfast room is packed to capacity. Another group is here with backpacks, obviously having checked out of their rooms, but they’re not going anywhere. One asked their guide if they should move to the second dining room downstairs to give everyone else more room to eat breakfast, which sounded like an extremely sensible idea, but their guide said no, just sit here! There are barely enough seats and tables for everyone packed in here at the moment, and more of our group will be arriving. Also, the WiFi is not working this morning, so we can’t even share our misery on Facebook! View from our room at the Maison Kasbah Taborihte, Todra Gorge. We are packing into the bus for an early start on the road, since we have a six hour drive today. We got a wake up call at 06:10, to be up and on the camels in time for the sunrise. Unfortunately the cloud had not dispersed overnight – in fact it had been raining on and off through the night. But at least it wasn’t raining or windy, and the pre-dawn stillness in the desert was beautiful. We are back on paved roads and threading through the town of Erfoud again to pick up our ongoing journey into the High Atlas today. After getting up and quickly using the toilets, we mounted the camels again for the walk back to the Kasbah Yasmina. We went a different route, doing an anticlockwise loop around one of the bigger sand dunes. The dawn was pleasantly mild and calm. The morning light filtered through haze and cloud on the horizon, though above us the clouds were broken up and would have looked beautiful if only the sun had peeked through as it came up. 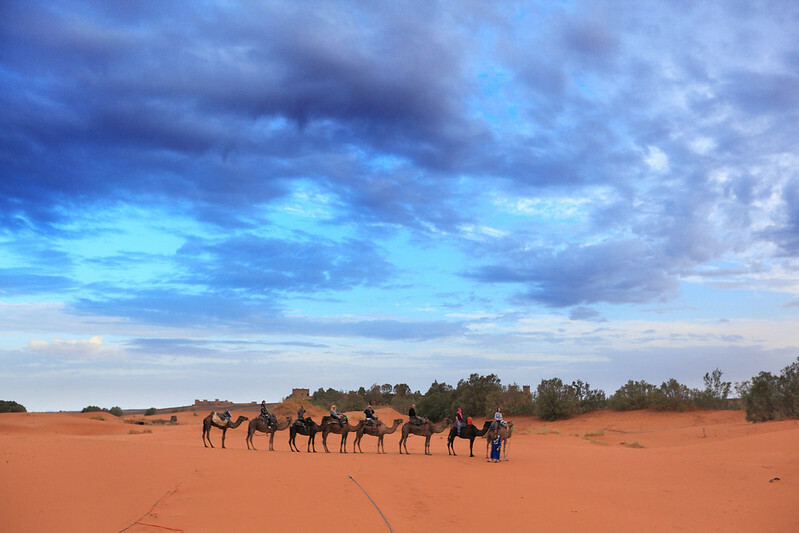 Dawn in the Sahara Desert. We were woken this morning around 05:00 by a howling gale blowing outside. It was rattling the windows and doors throughout the hotel and whistling through all the cracks between the windows and their frames. Every so often there would be a huge bang from somewhere in the hotel as a huge gust caught something. As the dawn light rose, we could see the sky was overcast, with ominous looking grey swirling clouds, and the trees were being thrown about, threshing wildly in the wind. We got up at 07:00 and dressed to go down for breakfast. Lahcen had mentioned the buffet began at 07:00, but we didn’t see any evidence of it, although we could smell cooking and hear coffee being made. Leanne joined us and I wandered over to see if there was anything happening near the kitchen, and spotted a corridor to a large room at the back of the hotel overlooking the pool courtyard, where the buffet was set up and some other people were already helping themselves. They turned out to be Spanish. Just as I’d gotten used to speaking French instead of Italian, one greeted me with a “buenos dias”, and without thinking I replied “bonjour”. 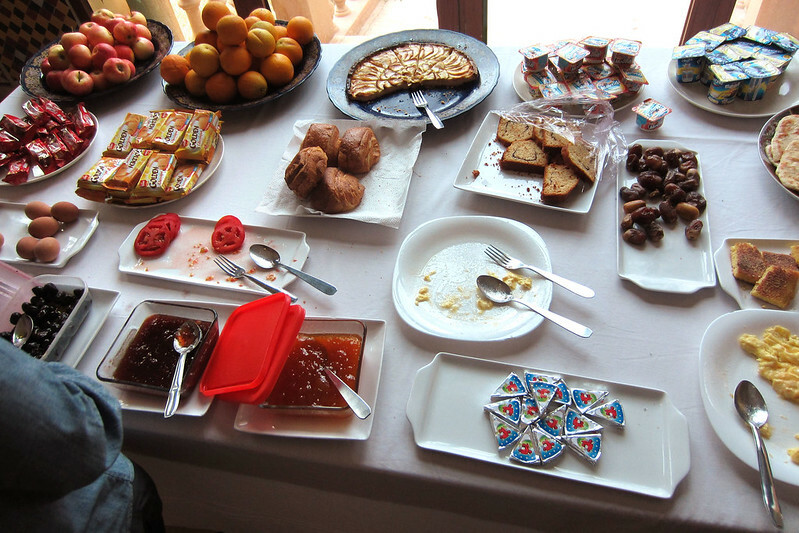 Breakfast buffet at Hotel Kasbah Asmaa.